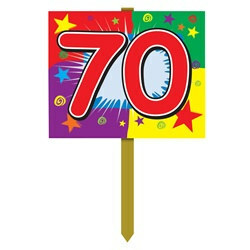 Celebrate a great 70th birthday by dressing up your yard with this 70th Birthday Yard Sign. The 70th Birthday Yard Sign is the perfect outdoor decoration to let everyone know its your big day. Each package includes one yard sign measuring 12 inches by 15 inches. Ordered 70h birthday signs to decorate my dad's yard for his birthday. These were perfect and arrived incredibly quick. Great quality too! Great quality and less expensive than at discount stores.